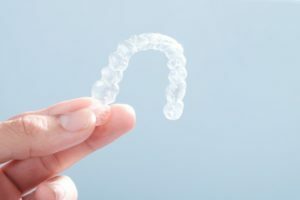 Before we talk about how to clean them, let’s briefly discuss what Invisalign aligners are. They are custom-made trays that are crafted from BPA-free plastic and comfortably adjust your teeth to their correct position. Given that Invisalign aligners fit so closely to your teeth, it’s important to keep them clean. That’s because bacteria are attracted to tight, warm spaces, which can lead to tooth decay. Therefore, every time you remove your aligners, you should be sure to clean your trays properly. Rinse – When you first remove your aligners, be sure to rinse them before the saliva on them dries. This is important because your trays can be infested with several bacteria that can contribute to tooth decay. Soak – After a thorough rinse, you should then soak your aligners in a solution consisting of denture cleaner or Invisalign cleaning crystals. Light Brushing – Using a toothbrush designated just for cleaning your aligners, you can gently brush your trays before re-inserting them to remove any excess plaque. Follow that up with another rinse, and your aligners fully cleaned. Your oral hygiene is just as important as your efforts to keep your aligners clean, and when wearing Invisalign trays, you have the freedom to remove them. So take advantage of this opportunity by brushing and flossing at least two times a day. Your brushing efforts will agitate and rid your teeth of excess food particles and bacteria. Flossing, then, cleans the remaining 40 percent of your teeth by probing the hard-to-reach spaces. The payoff, when you are diligent about performing these tasks, is that you’ll have a healthy and beautiful smile. So are you ready to correct your smile imperfections and gain the confidence of having beautiful teeth? If so, then reach out to your Invisalign dentist to learn more about how you can benefit from this treatment method and get more tips on keeping your aligners clean. Dr. Kathy Lam is just as passionate about oral health today as she was when she first received her dental degree. Furthermore, she enjoys seeing smiles flash across the faces of happy patients. To learn more about how Dr. Lam can help you achieve the smile of your dreams, visit her website.